starts with the understanding of the additive color system and its color circle. The RGB|CMY Digital Color Wheel: A Banquet of Color! How is color produced in the computer? 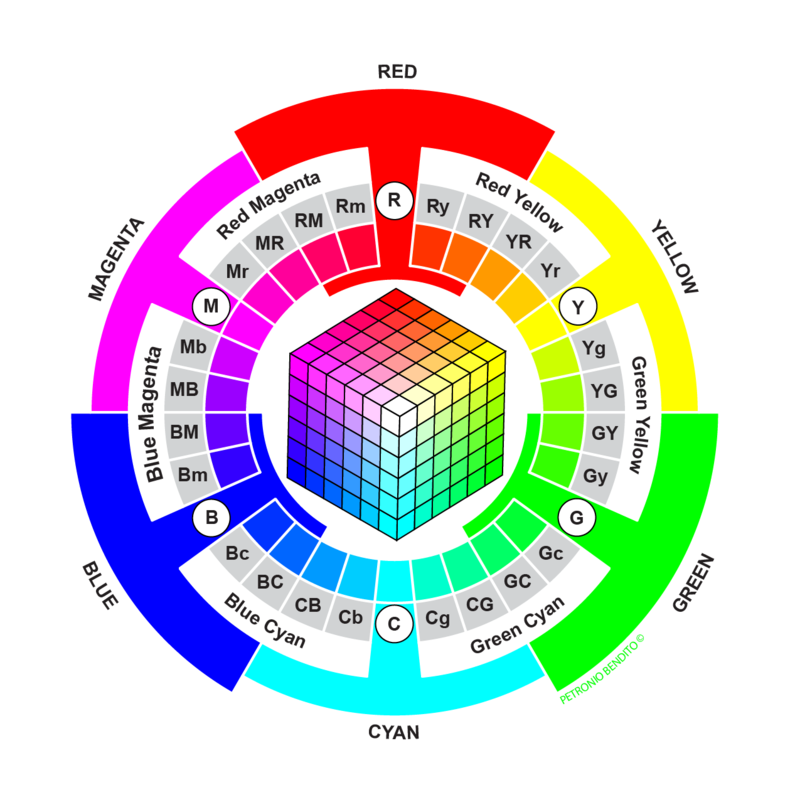 Developing color palettes on the computer screen is much more efficient and fun when you understand the RGB color space and its RGB|CMY Digital Color Wheel. 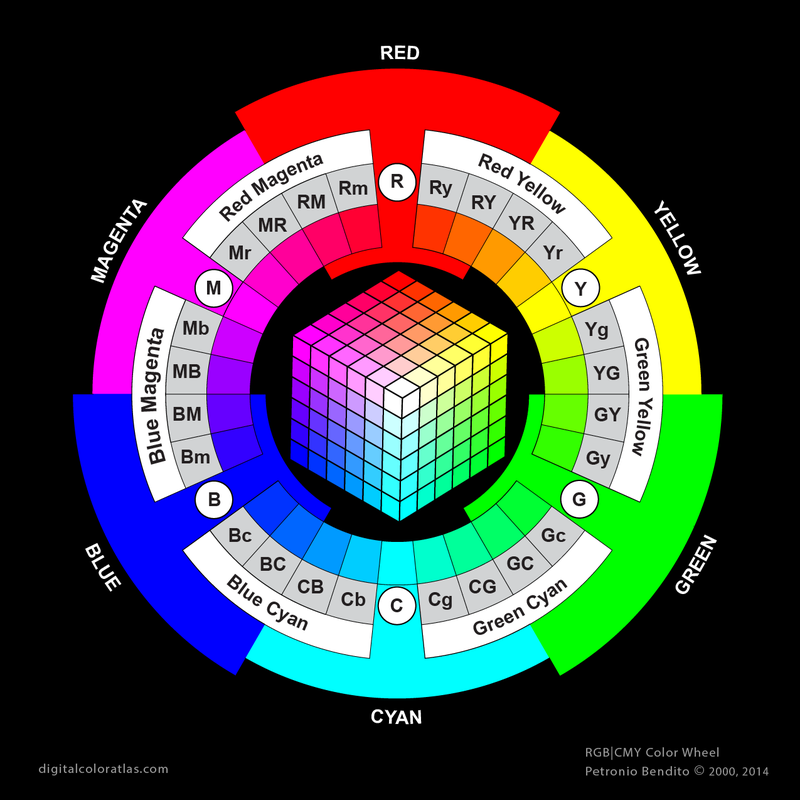 Once you learn about the color wheel, you can learn other aspects of digital colors, design techniques, and color combination. The best way to learn how colors are produced in the computer is by looking at the screen with a microscope. Seeing is believing! Here's the good news: there are several brands selling inexpensive portable ones online. If you get a microscope you can follow my tutorials. Otherwise, keep reading. 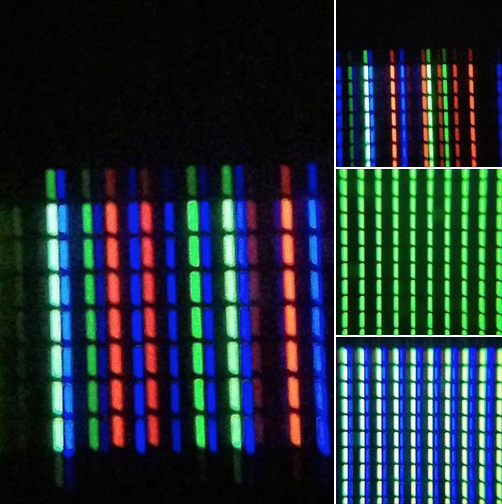 The photos below were created by looking at images on a pixel level on the iPad's screen with a Mini Bras microscope attached to an iPhone. Depending on where you direct your gaze, you will find on the screen tiny filaments of red, green, and blue lights. These images were taken with a Mini Bras microscope attached to an iPhone while looking at images on an iPad. We will use the RGB|CMY Digital Color Wheel above to explain how this works. If you have the microscope you can download the free test pattern below and try it yourself. So what is going on? The screen projects red, green and blue lights with various intensity to produce the colors you see. Colors are wavelengths captured by the rods and cones in your eyes and interpreted by the brain. Your brain is a color mixing machine! Now we will take a closer look at white. You will notice that the white area of the screen is filled with filaments of intense reds, greens and blues. When you look at the black section of the screen, you will notice that the red, green and blue lights are gone. Now let's watch how the the colors will dim as you move from White to Black in the gray scale of the RGB Test Pattern. I will take this opportunity to introduce some technical terms. The RGB|CMY Digital Color System is an additive color system. That is the physics of mixing light to create all the beautiful colors that you see in your digital gadgets' screens. Tertiary colors are made from a combination of primary and secondary colors. For example, Red (R) and Yellow (Y) produces the set of four tertiary Red-Yellows. The transition steps in between the primary and secondary colors are what make up the tertiary color sets. Between a primary and secondary, each tertiary color set is divided into four transitionary sub-categories. The notation for the tertiary color is the combination of the two beginning letters of the colors they are made of. To follow the development of this page, join our mailing list. Birren, Faber. The Color Primer: A Basic Treatise on the Color System of Wilhelm Ostwald, New York: Van Nostrand Reinhold Co., 1969. A more detailed explanation of this notation can be found in the following paper: Bendito, Petronio. RGB Colour Palette Based on Hue Relationships [proceedings]. 10th Congress of the International Colour Association, Granada, Spain, 2005.